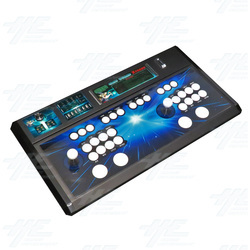 The Xtreme Game Wizard Control Panel Upgrade Kit is designed for customers who have already purchased a Game Wizard Vewlix machine and would like to turn their arcade machine into a multi platform gaming machine compatible with a range of consoles! The Xtreme Game Wizard Control Panel Upgrade Kit allows customers who have already purchaseda Game Wizard Vewlix machine and would like to upgrade their machine to the advanced Xtreme machine! This control panel upgrade kit will make your machine compatible with Xbox 360, Xbox One, PlayStation 3, PlayStation 4 and PC tower, while still being able to play JAMMA boards and arcade mother boards! Play all your favourite Xbox, PlayStation and PC games using classic arcade controls with this advanced multi platform arcade machine! The upgrade kit includes the Xtreme Game Wizard control panel, which features two jopysticks (one per player), 28 pushbuttons (8 pre-mapped buttons, 3 extra buttons for mapping, Player Start Button, Home button and Back button for each player), and 4 trackball (2 per player), and includes the PCB to translate the controls to classic arcade controls, and a compatible HDMI converter. PLEASE NOTE: This product is only available for sale to existing Highway Entertainment customers who have purchased a Game Wizard Vewlix arcade machine - proof of purchase is required.